President Obama should pardon the nation’s leading political prisoners and whistleblowers as a lasting legacy, particularly in view of his uplifting rhetoric and his party’s losses Nov. 8. Justice for those who have been framed in high-profile, historic cases — which include the assassinations of President John F. Kennedy and his brother Robert F. Kennedy — would provide a vital civic lesson as the nation wrestles with what Electoral College winner Donald Trump has called his campaign for "law and order." Many Americans in the plurality that supported his Democratic rival Hillary Clinton interpret Trump's words, rightly or wrongly, as code for repression. A bold pardon plan for the Obama administration’s final weeks would channel much of the sadness, anger and bickering prevalent among many Democrats who outvoted Republicans in the popular vote by about one percent but still lost the presidency, Congress, and soon the Supreme Court. Pardons would redress the Obama administration's failings in several specific criminal cases — and bolster reform efforts more generally, including those envisioned by Republicans. We recommend (and are doing so in lectures in Washington, DC and Dallas this week) that Obama show mercy to a representative sample of still-living defendants in political prosecutions. In some cases, political leaders were imprisoned for long terms far out of proportion to their conduct. In other instances, patsies took the fall for major crimes and brave whistleblowers were crushed. These injustices have cleared the way for more powerful malefactors to escape. Perhaps worse, honest law enforcers, whistleblowers, and other good citizens are being discouraged for the future. Our non-partisan Justice Integrity Project has documented these abuses extensively, as well as the way powerful financial and intelligence operatives assisted the president's early career in secret. 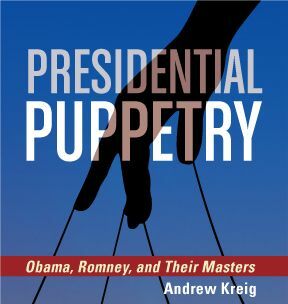 Today, we draw on these previous columns and our book, Presidential Puppetry, which contain extensive appendices citing others' reporting and evidence. The material today is blunt. That's needed to cut through the post-election clutter of punditry. Therefore, the president probably would not like it if he saw this. So, this column is not aimed for his attention but for yours. You cannot pressure effectively without the basic facts. 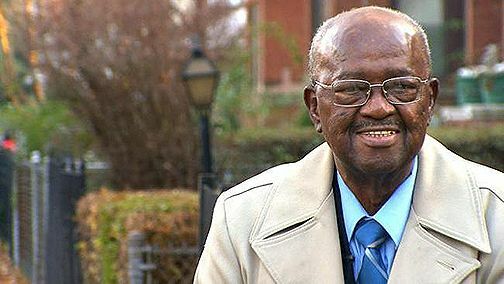 Several of the recommended pardon recipients, such as President Kennedy's former Secret Service protector Abraham Bolden (shown above), met their unjust fate because their brave whistleblowing sought to redress some of the nation's most outrageous scandals. Malefactors so powerful as to constitute a "Deep State" of hidden government controllers created some of these scandals. Other defendants, such as Sirhan Sirhan, the accused killer of the leading 1968 Democratic presidential contender Robert Kennedy, appear to have been fall guys set up to hide the intrigues that shape our political landscape today. Even if Sirhan did kill Kennedy, as seems unlikely from the evidence, Sirhan should have been released long ago under standard parole guidelines. Instead, authorities are able to keep any important secrets hidden. The photo of Kennedy's close friend Paul Schrade at right symbolizes the torment felt by some of those in the know about the nation's deepest mysteries. The photo was taken by an Associated Press pool reporter during a closed February hearing after California authorities again denied Sirhan parole unfairly and with scant explanation. Schrade was shot by Sirhan in the head during the 1968 killing in a pantry of the Ambassador Hotel. Schrade is among those who believe Sirhan was firing a gun from Kennedy's front and could not possibly also have shot Kennedy from behind with the fatal bullet. Yet authorities perpetuate the conventional wisdom through the years after destroying evidence, ignoring witnesses like Schrade, and keeping Sirhan behind bars. Therefore, it would take an act of political courage for President Obama and his team seriously to reopen any of these mysteries. But the important point is that action by Obama would lessen the public's plight, not just that of defendants. That would make pardons all the more impressive for his legacy because they would illustrate how he changed from his announcement just before taking office in 2009 that he would "look forward, not backward" at alleged government misconduct. Commentators interpreted Obama to mean that he would essentially ignore previous government crime, such as CIA torture. Obama issued just one presidential pardon during his first term. That was far below the number granted by his predecessors. Obama's first White House counsel, Gregory Craig, has since explained that presidents and governors these days risk hurting their reputations by using their constitutional powers to grant clemency. So, increasingly, few of them undertake a responsibility that Constitution framers regarded as essential for chief executives to grant, as we reported in a 2012 column Presidential Clemency System Broken, Experts Say. The trend illustrates yet-another aspect of the decline of rule of law and is particularly harmful when used to silence those involved in historic events since at least some person released is bound to become controversial. Obama granted vastly more clemency actions during his second term. But he took few risks because he and his pardon office at the Justice Department focused on low-profile offenders. The president reduced 102 sentences last month according to a CNN report, Obama reducing 102 inmates' sentences, the latest batch in a record-setting effort by the White House to reverse harsh sentences for mostly nonviolent drug offenders. "Obama has now granted clemency to 774 individuals, the vast majority of whom were serving time for nonviolent drug crimes," the report said. "Just in the past year, Obama has granted clemency to 590 prisoners, the most commutations in any single year of US history." Few of the beneficiaries were known to the public. Thus, the president conserved his political capital especially in his first term by studiously avoiding high-profile clemency that might annoy the nation's power structure, which has been instrumental, if not treasonous, in some of the major cases described below. The president could simply limp through his remaining weeks and ceremonies (including the annual symbolic pardoning of a turkey at the White House) as he and the nation await the dismantling of his major policies and programs under a Trump presidency and Republican-controlled House, Senate and Supreme Court. 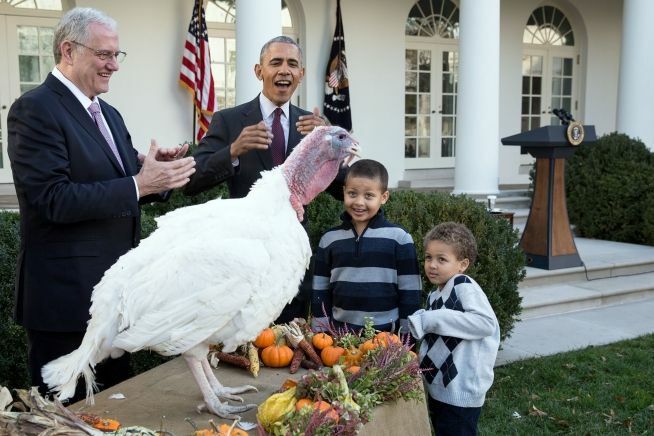 The White House photo above from last year on Nov. 25 displays a feel-good moment. 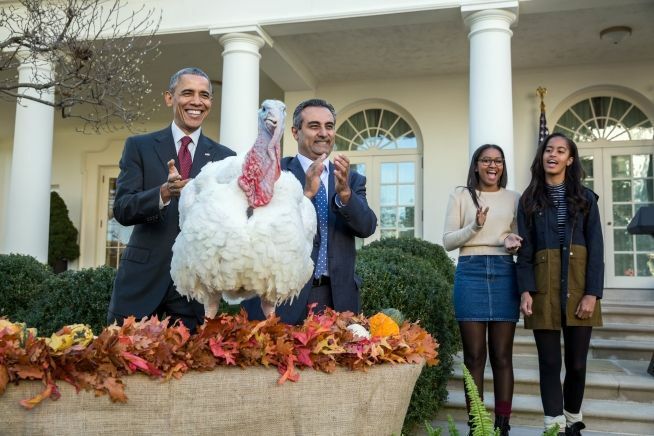 The president, his daughters Sasha and Malia, and National Turkey Federation Chairman Jihad Douglas participated in the annual National Thanksgiving Turkey pardon ceremony in the White House Rose Garden. But a difference this year is that many people do not feel good and want more than photo ops and rhetoric from leaders. There is still time to change beyond a final clemency, which is reported as likely to benefit additional nonviolent drug offenders but not famous defendants. USA Today reported Here's why Obama likely won't pardon Clinton on Nov. 14. However, the president could do what he wanted, just as his predecessors did. A Washington Times story emphasized the latter perspective in Obama executive orders, regulations, pardons expected as presidency draws to close. The president entered office as a successful constitutional law adjunct professor at the University of Chicago after serving as the president of the Harvard Law Review, perhaps the most prestigious post for a law student in the entire nation (in part because Harvard is far larger than its rival top schools). Obama won the Nobel Peace Prize in the fall of 2009 after being nominated during his first month of office on the basis of high hopes that he would reform government. With a more ambitious pardon policy, he could leave as the real deal. Update: On Nov. 22, the Washington Post reported in Obama grants clemency to 79 federal drug offenders, a policy the Trump administration is unlikely to continue that the announcement pushes the number of inmates the president has granted clemency to more than 1,000. The Justice Integrity Project has documented our disappointment again and again with him, his team, and mainstream news coverage. One example was our analysis last year, Media Helped Eric Holder Polish His Image...."Bloody Sunday" Selma March Next Month Provides Another Stage. 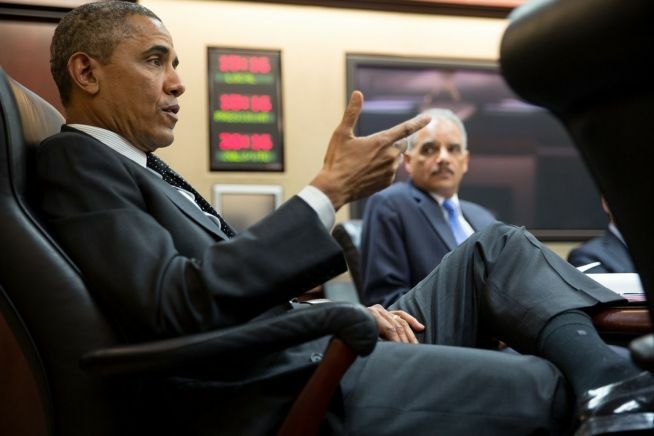 It showed what we regarded as the cowardly seven-year track record of Attorney Gen. Eric Holder (shown in an official photo), the president's close friend and political ally. Obama and Holder deserve credit for some actions, of course, including efforts to fight illegal vote suppression efforts by Republicans against minorities, students, and the disabled in likely Democratic districts. But ultimately even those efforts failed, as illustrated by many Democrat protests since the elections. We would argue that effective strategies against injustice must encompass better disclosure of the full scope of it, including exposure of ongoing injustices of historic scope. In that spirit, our recommended actions for these last two months are below. Time is of the essence. The annual Turkey Pardon on Thanksgiving should not be the main meal for those hungry for truth and justice. We provide here brief background before recommending specific people for clemency consideration. First, such terms as pardon, commutation and clemency have specific legal meanings but are often used almost interchangeably in popular discourse, including in news reporting. The precise legal terms and availability in the federal system are summarized at the U.S. Department of Justice Office of the Pardon Attorney, and in our appendix below. The appendix contains also links such as this list showing how U.S. presidents, especially recent ones, have used the pardon and clemency powers bestowed by the U.S. Constitution. Pardons by President Bill Clinton included 120 in his last days, including one approved by Holder for hedge fund tycoon Marc Rich, which prompted a scandal that still looms over Democrats (in part because the FBI released documentation about it Nov. 1, helping to foster the anti-Clinton corruption theme that Republicans had used throughout the campaign0. Current FBI Director James Comey, a Republican shown at right, had criticized the Rich pardon during the Bush administration and Trump surrogate Rudy Giuliani had been one of Rich's prosecutors. But Republicans also have a history of pardoning high-profile cronies, including multiple Iran-Contra defendants pardoned by President George H.W. Bush. His son, President George W. Bush, controversially also pardoned White House aide Lewis "Scooter" Libby. 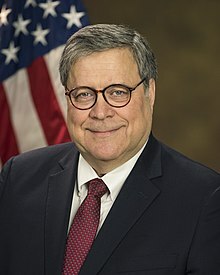 Libby, a former Marc Rich attorney who recommended the financier's pardon, was convicted during the Bush administration of exposing for political reprisal the CIA covert status of Valerie Plame Wilson, thus endangering her, her family and her network of CIA informants worldwide. Finally, presidential pardon power can be wider than suggested by the pardon attorney's website but is limited to the federal system. Thus, a president could pardon an individual in advance of any indictment, as President Ford did with former President Nixon after Watergate. Some suggest that President Obama do so with 2016 Democratic nominee Hillary Clinton following a Trump campaign in which his surrogates repeatedly led campaign chants of "Lock Her Up!" despite FBI findings that she had committed no crime. However, a president cannot order release of a state prisoner such as Sirhan. But Obama could use the presidency as what Teddy Roosevelt called "A Bully Pulpit" to encourage officials to reconsider their treatment of Sirhan and otherwise recognize the public interest of a new investigation. In the same way, Obama could ask the National Archives not to delay until next fall its release of remaining JFK assassination records. Instead, the archives could release records on a rolling basis, ASAP. The "JFK Act" unanimously passed by congress in 1992 requires a final record release by next fall. But the CIA has resisted some important disclosures, supposedly on national security grounds and not to prevent mere embarrassment to the agency. At the top of our list for clemency on these grounds is Abraham Bolden, whom President Kennedy personally recruited as the first African-American ever to guard a president for the Secret Service. In Bolden's well-received 2007 memoir The Echo From Dealey Plaza and otherwise, Bolden wrote that some of his Secret Service colleagues hated Kennedy, in part because the president was leading the desegregation of the South via the Justice Department under his brother, Attorney Gen. Robert Kennedy. The result was that many Secret Service personnel were failing in their security responsibilities, according to Bolden's account. He sought to warn the investigating Warren Commission in 1964 of his observations after Kennedy's 1963 assassination. But Bolden was instead quickly arrested, indicted, framed, and imprisoned on corruption charges. Bolden's primary accuser, an indicted counterfeiter, promptly recanted his trial testimony that Bolden sought a bribe, saying the bribe claim was concocted by federal prosecutors who took the Fifth Amendment rather than explain what happened. Remarkably, Bolden's conviction still stood, and he was put into solitary confinement that kept him away from telling anyone about JFK's protection, or lack thereof. We are among those who have extensively reported and vindicated Bolden's account, as in our column last year, Pioneering Black Secret Service JFK Guard Warns Of Current Lessons. Bolden's unjust imprisonment and its implications remain neglected because examination would shatter so many illusions, sustained by the media among others, about law enforcement, and a code of honor among presidential protectors, in particular. The vast bulk of elite law enforcers live up to their profession's ideals but a few undertake apparently criminal actions, as historian Vincent Palamara demonstrated in his comprehensive 2013 book, Survivors Guilt: The Secret Service and the Failure to Protect JFK. The problem, of course, is that for anyone in official circles to recognize past injustice in the particular case of the JFK murder would be to open the Pandora's Box of many other still-hidden secrets. Yet it is hard to imagine a more apt case for presidential clemency than compassion for Bolden, a Chicago resident who suffers in great back pain and is in otherwise failing health. Even so, Bolden is scheduled to speak via Skype to a major conference for JFK researchers and concerned citizens from Nov. 18-20 at the Crowne Plaza Hotel in Dallas. Bolden will receive the organizer's annual award for his courage and service. But the big prize of a pardon remains at his president's discretion. Former Alabama Gov. Don Siegelman, a Democrat still imprisoned for 1999 conduct that was not even a crime, is next on our list. So is Siegelman's co-defendant, Republican businessman Richard Scrushy, who was sentenced by their corrupt federal judge to a seven-year prison term on similar charges. The central charges were that Siegelman reappointed Scrushy to a state regulatory board in return for a large contribution by Scrushy to defray the costs of a 1998 referendum campaign for a state lottery that Siegelman supported to win more funding for K-12 education. A Siegelman aide coached by prosecutors in about 70 pre-trial sessions not reported to the defense (as required by law) provided the key prosecution testimony of an illegal quid pro quo after the witness was threatened with a 10-year term if he did not give the required testimony. Many legal experts have argued that Siegelman's reappointment of Scrushy to the board in 1999 after the businessman had served there for Republicans was not even a crime, and that similar conduct is regarded as routine on local, state and national levels. Like many others, our interpretation is that Scrushy's sentence on corruption charges essentially punished him for not perjuring himself like the cooperating witness to help corrupt prosecutors convict Siegelman falsely. As extra reprisal, insiders obtained a $500 million fraud judgment against Scrushy in a civil case while he was imprisoned, thus stripping him of his wealth while he was nearly helpless behind bars. We have often reported on the cases, beginning with a major investigation the Huffington Post featured on its front page in 2009, Siegelman Deserves New Trial Because of Judge’s ‘Grudge’, Evidence Shows….$300 Million in Bush Military Contracts Awarded to Judge’s Private Company. Our most recent column before this one, GOP Agitators Seek Renewed Clinton Email Probe, also reported on the Siegelman case in the context of potential Trump appointments to the Justice Department and courts. Many courageous whistleblowers risked everything to warn the public that the previous GOP Justice Department was framing Siegelman and Scrushy, and that its allies in Alabama politics had electronically flipped some 3,000 votes in Siegelman's 2002 re-election campaign during late night operations in Baldwin County so as to reverse his initial re-election victory. The upshot was to remove from public life Democrats like Siegelman who might rise or continue in high office. Siegelman, as one of the most popular politicians in the Deep South and a potential centrist presidential candidate, was a special target from the very day he took office in 1999, as previously reported, and particularly after he sought re-election in 2006. A special federal-state inquiry run out of Maxwell-Gunter Air Force Base in Montgomery ultimately resulted in a split-verdict in a second trial for both Siegelman and Scrushy, with sentencing in 2007. Scrushy, a Republican is shown with one his 11 children while he served his long sentence. His ordeal illustrated what happens to witnesses who fail to cooperate in a corrupt prosecution. Ruin. Meanwhile, probably no prosecution in modern American history had so many courageous whistleblowers and concerned citizens speak out against it. Alabama activist Pam Miles has operated a pro-Siegelman blog for more than a decade and traveled throughout the nation to build both grassroots and top level government support for Siegelman. She concurs with our estimate that more than 200,000 protests have gone to the Bush or Obama administrations and Congress protesting the Siegelman-Scrushy prosecution, a total far above the 79,000 signatures in the current campaign to the Obama administration led by Siegelman's family. Miles recalls that then-Alabama congressman Artur Davis called her in 2007 to ask her to stop urging people to call Congress after Siegelman's sentencing because the call volume was shutting down the House switchboard. But no officials have responded in any meaningful way except to vindicate the federal prosecution. So, many of the whistleblowers have been crushed and discouraged by the inaction. Workplace and other reprisals have further victimized whistleblowers and those who refused to perjure themselves. No officials dare confront the powerful figures behind the prosecution after seeing what happened to whistleblowers. Previous protests are simply discarded down the Memory Hole by each new batch of bureaucrats, doubtless including very soon those in the Obama administration. That is the Obama-Holder legacy so far in the most notorious human rights case of their administration. They can pardon Siegelman and Scrushy. Our next recommendation is on behalf of former Qwest Chairman and CEO Joseph Nacchio, head of a major telecom federal contractor and shown at right. 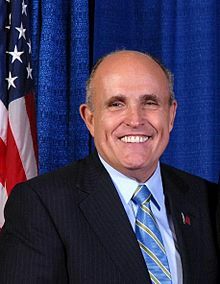 He was railroaded to prison on highly dubious insider trading charges in clear reprisal for his trying to protect his customers from illegal, warrantless federal government surveillance before 9/11 in the early days of the Bush administration in 2001. Nacchio, the leader of the regional Bell provider for 14 Western states, also chaired two national telecom advisory councils under the then-new Bush administration. He thus appeared to be extremely well-positioned at the highest levels of the telecom, IT, and federal contracting sectors. But eight months before 9/11 in 2001, Bush officials unsuccessfully asked him to provide customer data en masse for the National Security Agency (NSA). As a prudent and law-abiding executive, he made the mistake of requesting a warrant or some other official request before complying, thinking that his precaution was reasonable. Instead, government officials made an example of him to his telecom CEO peers — who thereupon all complied with such requests. Government officials as part of their reprisal cancelled many of Qwest's array of government contracts, thereby cratering his company's stock price. That stock price tumble criminalized Nacchio's sale in early 2001 of stock options, a routine part of corporate compensation for such company executives. Backed by experts, Nacchio unsuccessfully argued during his defense from insider trading criminal charges that CEOs frequently hear both good and bad internal predictions that do not arise to "material" information whose disclosure to the stock-trading public is required to avoid liability under securities law. The U.S. Chamber of Commerce, among others, endorsed his legal position in briefs to the Supreme Court in Nacchio v. United States. But Nacchio's federal trial judge in Colorado made highly dubious, pro-prosecution rulings, leaving many legal observers mystified — at least until the judge's personal scandals helped identify his prosecution as a kangaroo court frame-up. Authorities imposed a six-year prison term on Nacchio and also fined him $19 million fine and imposed an additional $44 million in forfeiture penalties. As a general matter, the Justice Integrity Project has extensively investigated how both government and private parties use sexual and financial blackmail to pressure government officials for favorable rulings. In that vein, we found it suspicious that both Nacchio and Siegelman-Scrushy underwent frame-ups orchestrated by federal judges mired in scandal so awful that each judge had resigned his lifetime appointment after the trials. 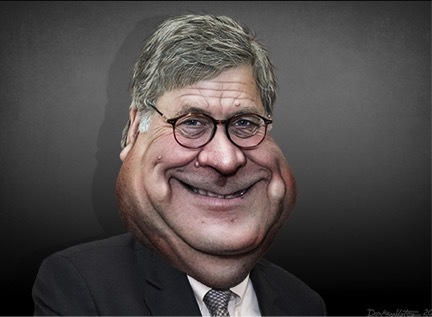 Those scandals were likely known and used by prosecutors for leverage, especially given the government's institutional advantage in hearing courthouse gossip and its widespread electronic surveillance used on all Americans. But the judicial scandals were unknown at the time of trials to the defendants and their attorneys, as we have reported here previously. Last year, Nacchio accepted the annual "Corporate Courage" award at the annual Whistleblowers Summit located on Capitol Hill. He and Richard Scrushy each spoke both at the Summit and separately at the National Press Club about their experiences. Nacchio, having completed his six-year sentence, has denounced the Obama administration's privacy protections as inadequate even after a so-called reform enacted in June 2015 in response to disclosures by whistleblower Edward Snowden two years previously. Therefore, Nacchio is unlikely to be among the favorites of those in the Obama administration who join the president in approving his last batch of clemency recipients. But that would make a grant for him all the more impressive. 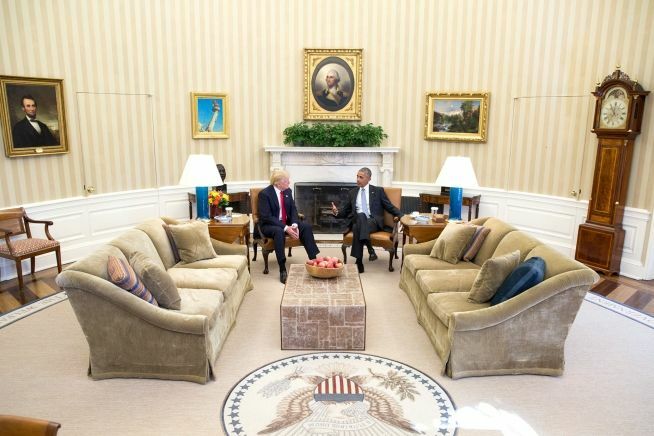 Obama has acted graciously during his eight years in office with many others, including Donald Trump, even though Trump built his new political career on the phony "birther" claim against the president's legitimacy. If Obama can forgive Trump he should be able to provide justice for Nacchio, who, after all, was persecuted for simply protecting his customers' constitutional rights to remain free from unwarranted government surveillance. Like Nacchio, former National Security Agency (NSA) senior executive Thomas Drake deserves presidential clemency for a political prosecution brought by the Bush Justice Department. 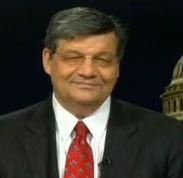 As reported in our 2015 column Mr. Drake Goes To Washington, Drake was a career military and intelligence officer who became concerned that NSA was wasting about a billion dollars to acquire a data system in a sweetheart deal that superseded a paid-for cheaper system that worked better. Higher-ups failed to listen to Drake. He took his findings secretly to the Baltimore Sun reporter, and ended up being indicted on spy charges that could have imprisoned him for the rest of his life. Drake, who narrowly escaped life in prison for communicating with a Baltimore Sun reporter, said the government has the ability to make such conduct illegal retroactively. Drake has said he was extremely fortunate in finding effective counsel through the Government Accountability Project and encountering a fair-minded federal judge. Under pressure from the judge, the Justice Department reduced its spy charge against Drake to a misdemeanor in a plea deal. Drake (shown in a photo by Noel St. John) warned the public last year at the National Press Club against the federal government's crackdown on whistleblowers. Drake's revelations and passion during his talk resembled James Stewart's iconic performance in "Mr. Smith Goes To Washington" protesting corruption, including during a Senate filibuster. Yet Drake focused on dangers far more important than the 1939 film's portrayal of corruption in Congress and the media. He deserves a pardon for such selfless actions and his long record of government service previously. Even more important, clemency would send a much-needed positive message to other whistleblowers, particularly those like Drake who were unsuccessful in reporting waste, fraud and abuse in the big dollar national security sector that is nearly impossible for outsiders to monitor, even those holding elective office. It should also be noted that there are a number of other whistleblowers prosecuted in this sector with excessively harsh and otherwise unfair methods and sentences. Space does not permit mention of all, much less a description of their cases. Among those being too harshly treated have been former NSA analyst Kenneth Ford, victim of an obvious frame up that put him in prison for six years. Others include former CIA officers Jeffrey Sterling and John Kiriakou, the blogger Barrett Brown, and six Colorado-based former security personnel known as "The IRP6" who are serving excessively long prison terms on highly dubious financial fraud charges after their software company failed. There is also Chelsea Manning, now serving in solitary confinement the longest term in U.S. history for a leaker, as reported by the Washington Post Nov. 14 in Chelsea Manning petitions Obama for clemency on her 35-year prison sentence. Illustrating the range of possible popular support for compassion, broadcaster Alex Jones, a staunch Trump supporter, called Nov. 15 for pardons for whistleblowers and leakers, including Edward Snowden, as a vital step to preserving freedom. Drake in a sense serves in our list as a surrogate representative for those above and their cases. Bank whistleblower Bradley Birkenfeld launched his tell-all memoir Lucifer’s Banker last month at the National Press Club with a harsh indictment of the nearby headquarters of the U.S. Justice Department. Birkenfeld, described earlier this year by CNBC as "the most significant financial whistleblower of all time," attacked law enforcers as being cowardly, self-seeking and deceitful in monitoring crime by top financial institutions that help the wealthy commit massive tax fraud. The schemes hide money, sometimes ill-gotten, and thus may hurt the criminals' spouses, business colleagues, fellow citizens, and governments. Birkenfeld, 51, helped American authorities recover an estimated $15 billion in back taxes, interest and penalties from wealthy tax cheats who worked with his former employer, UBS, the world's largest bank. UBS is at the center of Switzerland's notoriously secretive system that helped the wealthy evade creditors and facilitate crime that includes drug and arms trafficking. "The great irony," Birkenfeld told about 80 guests at the press club Oct. 18 "is that the only banker imprisoned for the financial scandals was me, the whistleblower." "The problem," he continued in an interview the next day with RT, "is the U.S. Department of Justice is corrupt." His Lucifer’s Banker memoir, subtitled The Untold Story of How I Destroyed Swiss Bank Secrecy, is an engaging, important and otherwise compelling overview of his unique, courageous role in exposing and reforming Switzerland's system of secret banking for the world's mega-rich. 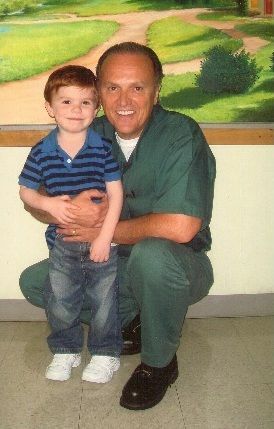 His story also shows how he endured a 40-month prison sentence. After serving 31 months (with time off for good behavior), he is now free to tell the tale, bolstered by $104 million (before taxes) that he and his lawyers managed to obtain as reward money despite the best efforts of Justice Department tormentors to hinder the full force of his disclosures. Particularly important is that authorities — and not just the Justice Department but also Secretary of State Hillary Clinton and her colleagues — sought to protect many of the rich and powerful tax cheats who could have been exposed, as we reported here in Courageous Memoir Denounces Banks. He continues to speak out, as in his C-SPAN interview rebroadcast Nov. 12 and 13, Bradley Birkenfeld Discusses "Lucifer's Banker." A much-deserved pardon would redress the balance whereby only the whistleblower was imprisoned, and more importantly encourage others to speak up during a new administration already showing an ever greater tilt toward secrecy and lax oversight of the wealthy and powerful. Below we describe how President Obama could have a major impact in public understanding of the 1960s assassinations of the Kennedys by advocating clemency and transparency even if it is difficult for him directly to impose transparency in his remaining two months. Sirhan Sirhan is serving a life sentence imposed for his 1969 first degree murder conviction in the 1968 shooting death of New York Sen. Robert F. Kennedy in the pantry of the Ambassador Hotel in Los Angeles. He is shown below in a mug shot from this year and at right at the time of his arrest at the scene, where he was wrestled to the ground after firing shots. The killing occurred shortly after Kennedy gave a victory speech upon winning the California Democratic primary for the 1968 presidential nomination. The victory over Sen. Eugene McCarthy (MN) put Kennedy on the way to his party's nomination and his likely victory in the general election against GOP candidate Richard Nixon. Sirhan was a former race track exercise trainer who had lost his track job after injury. Sirhan disappeared from his close-knit Lebanese Christian family's home in California for still-unknown reasons for months before the shooting. Sirhan has consistently maintained that he has scant memory of the shooting. He wounded, among others, Kennedy's friend Paul Schrade in the forehead. Schrade, a union executive, accompanied the senator after RFK's victory speech. Sirhan was convicted at trial, which featured a diary in his handwriting with the repeated words "RFK must die." 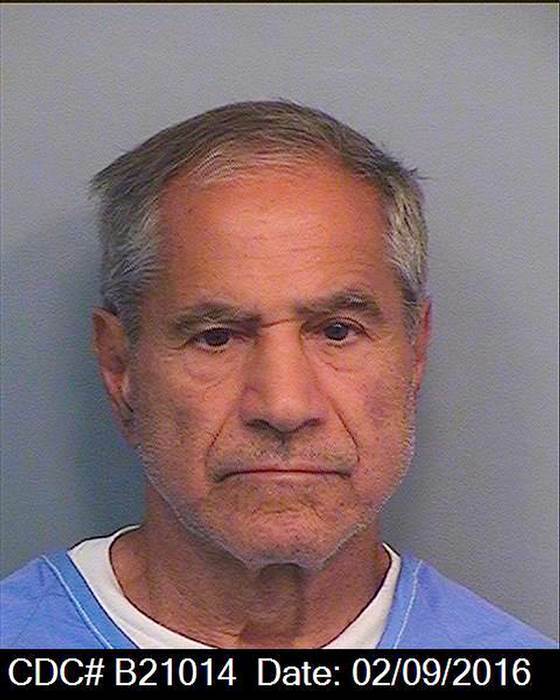 In February, California parole authorities as usual denied Sirhan's request for parole, stating briefly that he failed to show remorse. He became eligible for parole in the 1980s and can obtain parole review once every five years. That case summary is all that most people know, but a longer version can be far more dramatic and different. Independent researchers and concerned citizens for years have argued that it was impossible for Sirhan to have killed Kennedy, and that he was a likely patsy like his brother's accused killer Lee Harvey Oswald framed to hide the assassins who wanted to prevent another Kennedy presidency. In this scenario, Sirhan was a mind control victim who did just enough suspicious things (including wounding Schrade) to let the real assassin escape in the confusion. As part of the evidence of a conspiracy implicating authorities in a cover-up at the minimum, Los Angeles County Coroner Dr. Thomas Noguchi found that Kennedy was killed from a bullet fired approximately an inch from the rear, when Sirhan was reported by witnesses to have been several feet in front of Kennedy at relevant times. Los Angeles police, working closely with intelligence personnel, are alleged also to have hidden, ignored or destroyed evidence, including witness identifications of such leads as a "woman in a polka dot dress" reputed to have accompanied Sirhan with an unknown man. 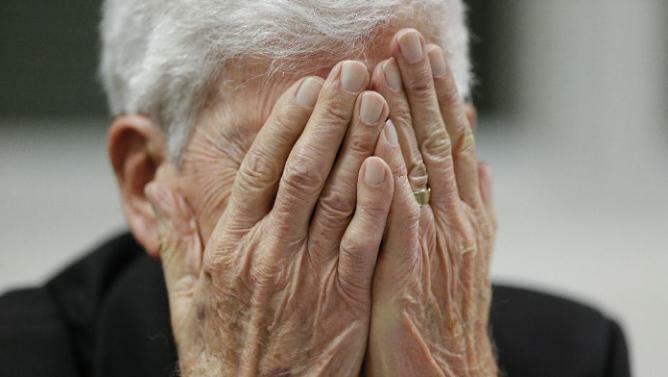 This year's parole hearing was especially dramatic because Schrade, 91, stepped forward to beg for Sirhan's release in dramatic fashion and to request a new investigation. He presented a letter from the slain senator's son, Robert F. Kennedy Jr., seeking a reopened investigation. After the decision Schrade (shown in a photo from documentary maker Interesting Stuff Entertainment) denounced the proceeding as a sham, and tried unsuccessfully to shake Sirhan's hand. Authorities barred the media from the proceeding aside from an Associated Press reporter writing an 854-word report, thereby adding to the Star Chamber elements of the case. Journalist Shane O'Sullivan, author of a book on the case, wrote a powerful series in February for the investigative site WhoWhatWhy excerpted immediately below and in our appendix, and RFK Assassination Readers Guide. Also, investigative reporter Fernando Faure published in June his memoir describing how as a young reporter covering the RFK murder he tracked the desperate movements of "The Lady in the Polka Dot Dress" and presented his findings to police, only to find they were thoroughly hostile to him and any evidence that failed to point to Sirhan's guilt. O'Sullivan's Feb. 16 report for WhoWhatWhy, The Full Story of the Sirhan Sirhan Parole Hearing, focused initially on what he called "the near-complete media blackout" of the parole hearing, which "means the world had to rely on one reporter’s account." O'Sullivan continued, "Here is the complete story of what actually transpired and matters." President Obama cannot order Sirhan's release but he can raise public consciousness regarding a need for a new investigation and a better parole process. The National Archives and Records Administration (NARA) has repeatedly announced that it plans to release by next September a remaining trove of more than 1,000 documents relevant to the JFK assassination and required for release under the so-called "JFK Act" passed unanimously by Congress in 1992. A president has the power to assist those who want continued secrecy, including tactics of heavy redaction that undercut use of the document. 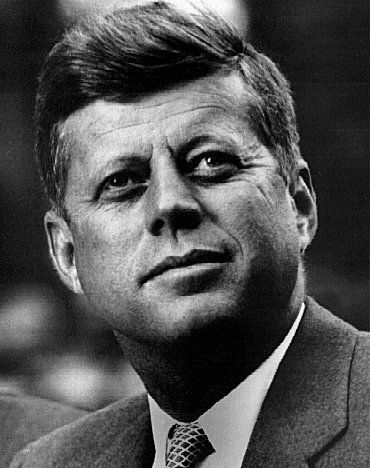 The vast majority of the documents are believed have been withheld for "national security reasons" from the three million pages of JFK documents so far released, which have proven immensely helpful to researchers, including the many who believe the CIA was instrumental in arranging the assassination and/or facilitating the cover-up on behalf of JFK's enemies, who included prominent Wall Street financiers, energy and agriculture tycoons, their top operatives at the CIA and FBI, Vice President Lyndon Johnson, Mafia leaders, Cuban exiles, and segregationists. We have examined the evidence so far in what is now a 31-part Justice Integrity Project Readers Guide To JFK Assassination: Books, Videos, Archives to help researchers of the assassination and its current implications. Our tentative conclusions so far are summarized there, with a representative column headlined: JFK, Nov. 22 and the Continuing Cover-Up. I am scheduled to speak Nov. 20 drawing on this column in a keynote lecture at an annual research conference at the Crowne Plaza Hotel near the Dealey Plaza location where JFK was shot. Based on near daily interaction throughout the year with other assassination researchers, we believe that the CIA, and hence a subordinate organization in Washington's power structure such as NARA, face a huge conflict of interest in NARA's effort to declassify next fall a full record of remaining assassination documents. This is because whatever the CIA is still withholding is highly likely to show if unredacted that the agency's role went far beyond the devastating incrimination already known. Indeed, my questioning of high level CIA personnel (on rare occasions when they are publicly accessible on the record) has indicated that even they do not know why or what their colleagues are seeking to withhold. In that circumstance, President Obama owes it to his legacy and the country to pressure NARA to release as much as possible before he leaves office. There is no reason to punt. Judges are forcing other agencies to work overtime to release what are likely to be far less important materials under Freedom of Information Act litigation. Obama is still the commander in chief, at least for now, and he can make progress on this if he dares or desires. Other People, Other Pardons: Hillary Clinton? David Petraeus? Edward Snowden? 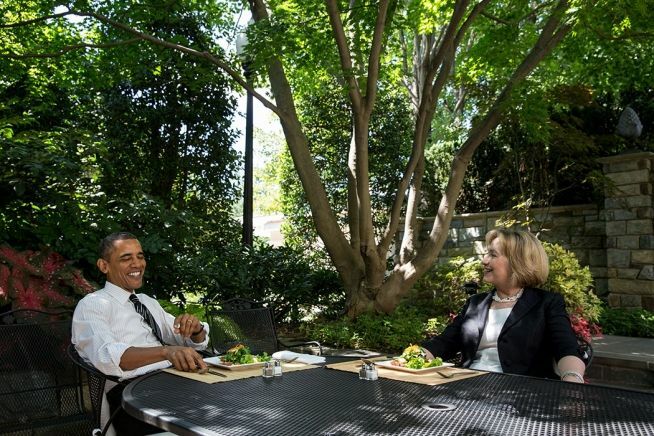 The President and then-former Secretary of State relax on July 29, 2013 on the White House patio: White House photo. As noted above, USA Today published on Nov. 14 Here's why Obama likely won't pardon Clinton, an extensive review by reporter Gregory Korte of reasons why Obama is not likely to pardon Clinton even though she was threatened throughout the campaign by Trump and even more persistently by his surrogates Chris Christie and Rudy Giuliani as they led chants of "lock her up!" at rallies. The USA Today reporter argued also more briefly that Obama was unlikely for the same reasons to pardon such others as former CIA Director David Petraeus, convicted Israeli spy Jonathan Pollard, intelligence contractor Edward Snowden or Pvt. Chelsea Manning, all of whom were accused or convicted of mishandling classified information. "The reason is simple," the reporter wrote. "None of them have applied to the Office of the Pardon Attorney for executive clemency." At last count, Hillary Clinton was winning the popular vote count by nearly one percent, with her one million vote lead expected to grow significantly with tabulation of late votes from California in coming weeks. But that popular margin is not expected to affect the Electoral College vote. Trump's conciliatory current verdict on the erstwhile "Crooked Hillary" should deeply disturb anyone who truly believes in a constitution-based "rule of law" even though Trump's words on their face seemed reassuring to those who worried as he consolidates the nation's power under his team. What Threats Face The Clintons — And Trump? While the Clintons themselves may have nothing to fear if they behave themselves (and act nicely to Trump), his track record indicates he views himself as the prosecutor, judge, jury and news reporter over all such public activity, with license to change his mind immediately if offended. Therefore, his opinion and power effectively removes the Clintons from a significant role as a major truth-teller in public life, especially on the most sensitive topics, lest they face the fate of Bolden, Siegelman, Scrushy, Nacchio, and others described above. Let's take a moment to underscore the stakes involved. Bolden conveyed an assassination threat against JFK on the latter's scheduled trip to Chicago in early November 1963 that may have played a role in Kennedy's last-minute cancellation of the trip. But, like a similar warning via an informant conveyed via FBI agent Don Adams, there was essentially no investigation that would have prevented the president's death or helped identify perpetrators, except for the frame-up of the innocent whistleblower Bolden. In the case of the convict Siegelman, we might be calling him "President Siegelman" now if not for electronic voting scam in 2002 and his frame-up along with Scrushy on phony corruption charges. Remember, this was for trying in 1998 and 1999 to find more financial support for K-12 education in Alabama. Instead, Siegelman and Scrushy were hauled from court in chains in 2007 by a corrupt and blackmailed judge who denied them liberty to post a bond, which white-collar defendants almost always receive after trial pending their appeals. Authorities first put Siegelman in continuous bus transfer between prisons as a special punishment inflicted for unknown reasons, and then in solitary confinement for good measure. All of these had the effect of removing him from contact with his attorneys and supporters. The police state tactics taught everyone a lesson that is frightening in a democracy: Do not support leaders who have been targeted. These are the kind of crimes against democracy that President Obama has so far avoided addressing with his "look forward" mantra regarding basic rights. Trump and his supporters have high stakes in this also, not just as citizens but as those who want his success and indeed survival. Properly considered, all U.S. presidents after the Kennedy assassinations and the attempts on George Wallace, Gerald Ford and Ronald Reagan must weigh carefully whether their conduct will inspire a similar attack. My conversations with security experts favoring a Trump presidency have for more than a year revealed deep worry from them, and me, that he might be targeted by Deep State interest regarded as behind the above-mentioned attempts (even those popularly described as by "lone nuts"), as well as the Watergate removal of President Nixon. Why? Because of Trump's unconventional policies, particularly in military and foreign affairs, which are regarded as just as threatening to empire-building oligarchs as some of the policies of Nixon, who was removed (according to recent historical research) even though he and his top aides did not authorize the Watergate break-in, which was instead undertaken by others with other motives conventionally portrayed. The gist is that we need honest, fearless officials, security experts, whistleblowers, reporters, professors and ordinary citizens, and we're unlikely to have enough of them if we do not care if they are murdered, fired, and falsely imprisoned. In this, we should not overestimate the independence of such elite bodies as the FBI, CIA, Secret Service and federal courts. 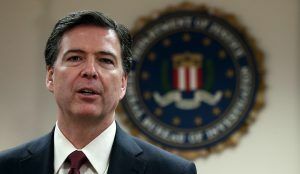 Although FBI Director James Comey's may not have planned for his unprecedented interference in the recent campaign to affect presidential and congressional results as they apparently did, the record of cases above is proof positive that leadership of these agencies can be highly political even if the vast majority of employees (many of whom I've known for years) are simply trying to do their jobs in a professional manner. We cannot know Comey's intentions, perhaps ever. But we can learn more, especially if Obama takes proper steps about such mysteries as the CIA's involvement in the JFK assassination and Warren Commission investigation. One commissioner was former CIA Director Allen Dulles, whom JFK had forced from office. We now know from declassified materials that Dulles used his Warren Commission post to help keep secret from the public accused assassin Lee Harvey Oswald's government ties. In terms of court review? Good luck on that. 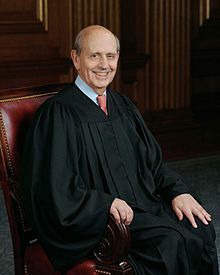 Did you know that the Supreme Court's longest serving Democrat, Stephen Breyer (shown above in an official photo), began his career by working as a junior staff member on the Warren Commission? He cannot be faulted too much, one might say, for participating along with many others as a young professional in that highly compartmentalized cover-up of the crime of the century. But the rest of us can at least observe that courts provide only a modest protection for us. And Democrats have their share of go-along, get-along careerists who never breath a word about removal of their leaders, via assassination or other coup, if it might undermine their own career ascendancy. 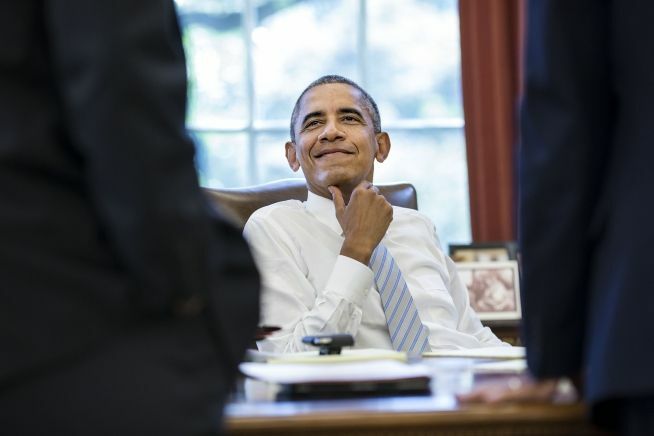 Ultimately, President Obama can do what he wants, but only so long as he is in office. Looked at in another way, he can put on a happy face, but either he or his supporters may be crying next year. Right now, the president is well-liked. He's done his job, part of which is posing for photo ops, such as the one at left from last Thanksgiving at a soup kitchen for the homeless. But Obama's legacy is not going to hold up well if his policies are discarded, his supporters are furious (if not targeted), and he sails off to a comfortable life without putting up a fight for the kinds of victims described here: Bolden, Siegelman, Scrushy, and the others. And let's not forget the dead Kennedys. If more evidence were released, or even some high level attention got focused on the cover-up, the truth would be even more obvious to the public that both were killed by the power structure. The two Kennedys, not at first but late in their young lives of leadership, were fighting a deadly battle against the puppetmasters on behalf of causes that most of the puppets in public life merely voice in rhetoric. Why on earth is President Obama smiling? Washington Post columnist Dana Milbank, an outspoken liberal supporter of Obama throughout the recent campaign, ranted on Nov. 14 against Obama's buoyant demeanor as the president boasted at a White House press conference earlier in the day about his accomplishments. 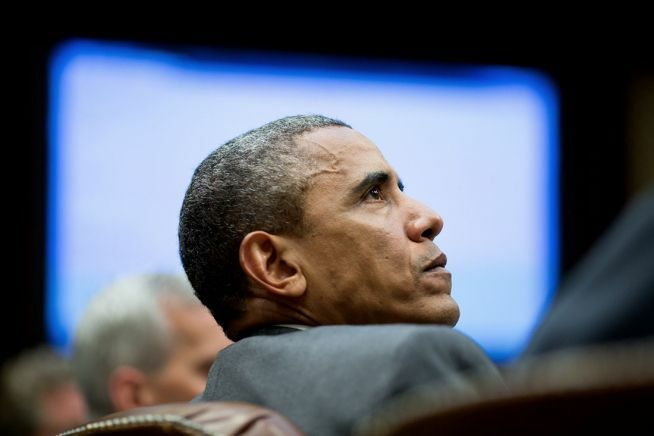 "Obama’s post-election remarks seemed utterly at odds with the national mood," Milbank wrote. "Half the country is exultant because Donald Trump has promised to undo everything Obama has done over the past eight years. The other half of the country is alarmed that a new age of bigotry and inwardness has seized the country. And here’s the outgoing president, reciting what a fine job he has done." "This has been Obama’s pattern," Milbank continued. "At times when passion is called for, he’s cerebral and philosophical and taking the long view — so long that it frustrates those living in the present. A week after an election has left his supporters reeling, Obama’s focus seemed to be squarely on his own legacy." For two months more, President Obama has a unique opportunity to upgrade his human rights legacy. If he chooses he can go beyond the policies that seem likely to be dismantled soon in significant part. Instead, he can redress the major injustices cited in this column, whatever the obstacles and odds, in the tradition of those honored by the late President Kennedy in his historical study Profiles In Courage of great and daring American heroes. 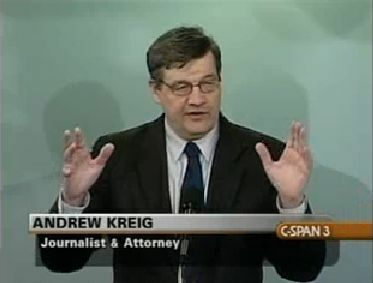 Justice Integrity Project Editor Andrew Kreig delivered lectures drawn from the column above on Nov. 17 at the National Press Club in Washington, DC. and on Nov. 19 at the annual "JFK Conference" near Dealey Plaza in Dallas, TX. Kreig, a Press Club member, attorney and editorial board member of "The Indicter" global human rights commentary magazine, spoke at a meeting open to the public of the McClendon Group speaker society at the Press Club. 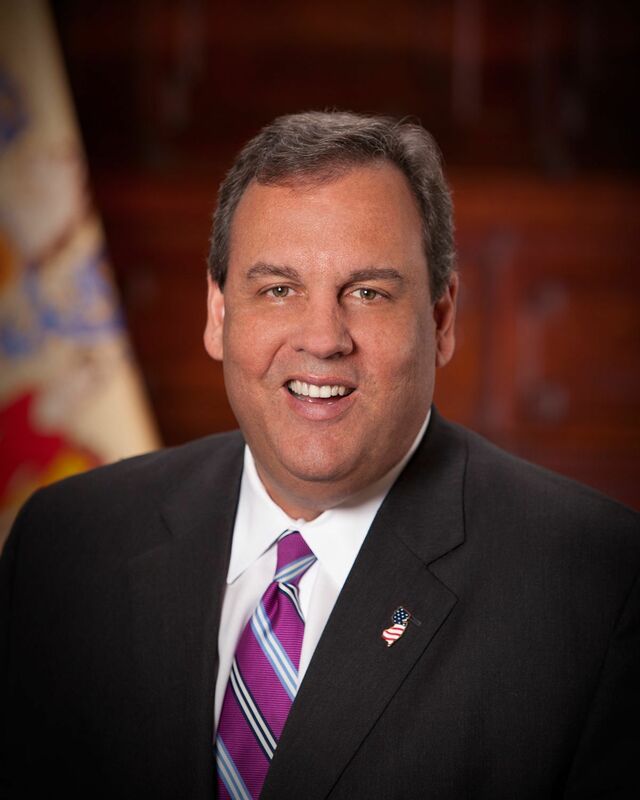 The public is welcome at the no-host ("Dutch treat") dinner, with remarks beginning at 7 p.m. Separately, Kreig, a board member of Citizens Against Political Assassinations (CAPA), was the evening keynote speaker at an annual conference of researchers at the Crowne Plaza Hotel. His topic "Not All Presidential Coups Are Assassinations" assessed suspected Deep State intrigues against presidents that began with President Kennedy's murder and are feared to have extended through recent elections. Justice Integrity Project, Presidential Clemency System Broken, Experts Say, Andrew Kreig, Dec. 11, 2012. The system of presidential clemency practiced for nearly two centuries no longer functions in practice in the federal system and in most states. That is the dire conclusion of a bipartisan, expert panel convened Dec. 10 by the Heritage Foundation in Washington, DC. "President Obama has found only one prisoner worthy of release" in the first four years of his administration said longtime law professor Albert Alschuler. He presented statistics showing that previous presidents used their Constitution-based commutation powers far more often until recent years. Craig said, "Everyone who looks at this must agree that the system is badly broken." Craig was White House counsel for a year beginning in 2009. He said, "There is no political constituency for reform. So people must do it for all the right reasons." He is a prominent litigator at Skadden Arps, who recently has been advising the family of Siegelman, whom he has known for more than three decades. Panelist Robert Erhlich, Maryland's governor from 2003 to 2007 and the first Republican to hold the post in 36 years, described clemency as a civic responsibility that brings heavy criticism because of the popular view that convicts must be punished harshly and relentlessly. Justice Integrity Project, Pioneering Black Secret Service JFK Guard Warns Of Current Lessons, Andrew Kreig, July 22, 2015. Abraham Bolden, the first African American to serve on the White House detail guarding a president, has a secret to share July 29 in Washington, DC: Gross security lapses enabled President John F. Kennedy's murder in 1963. Bolden will break the persistent media silence about those security shortfalls at the annual Whistle Blowers Summit beginning July 29 on Capitol Hill. The free event, themed “Black Lives Matter,” is from July 29-31. Justice Integrity Project, Former Political Prisoners Nacchio, Bolden, Scrushy To Warn of Democracy Threats July 29 At 'Whistle Blowers Summit' In DC, Andrew Kreig, July 10, 2015. Participants in three of the most controversial and important politics-tinged criminal cases in recent American history will condemn dangers to democracy July 29 at the annual Whistle Blowers Summit on Capitol Hill in Washington, DC. Former Qwest Communications International Chairman and CEO Joseph Nacchio, former Secret Service White House special agent Abraham Bolden, and former HealthSouth CEO Richard Scrushy will speak on “Exposing U.S. Political Prosecutions & Dangers To Democracy” on a 4 p.m. panel moderated by the Justice Integrity Project. Each speaker became a participant, whistleblower, victim, and now a hero in, respectively, the national debate regarding warrantless electronic surveillance, President John F. Kennedy's 1963 assassination, and the federal prosecution of former Alabama Gov. Don Siegelman, who remains imprisoned for 1999 conduct. The free, three-day event convenes government critics, the media, and other researchers, beginning at the Stewart Mott House July 29. Huffington Post, Siegelman Deserves New Trial Because of Judge’s ‘Grudge’, Evidence Shows….$300 Million in Bush Military Contracts Awarded to Judge’s Private Company, Andrew Kreig, May 15, 2009. The Alabama federal judge who presided over the 2006 corruption trial of the state's former governor holds a grudge against the defendant for helping to expose the judge's own alleged corruption six years ago. Former Gov. Don Siegelman therefore deserves a new trial with an unbiased judge ─ not one whose privately owned company, Doss Aviation, has been enriched by the Bush administration's award of $300 million in contracts since 2006, making the judge millions in non-judicial income. Justice Integrity Project, Legal Pundit Toobin Seeks Obama Pardon For Siegelman, Andrew Kreig, Jan. 17, 2015. The New Yorker Magazine's legal analyst Jeffrey Toobin last week advocated a presidential pardon for former Alabama Gov. Don Siegelman. In writing "Why Obama Should Pardon Don Siegelman," the commentator understated in erroneous fashion the gross injustice of the prosecution, according to Siegelman's co-defendant Richard Scrushy. The former HealthSouth CEO commented that Toobin is among the many journalists who have accepted a false prosecution narrative that Scrushy donated $500,000 in 1999 to the non-profit Alabama Education Foundation in order to obtain appointment to a governor-appointed regulatory board. Justice Integrity Project, Dana Siegelman’s Pardon Petition Drive Gains Momentum In DC, Andrew Kreig, Oct. 25, 2012, Dana Siegelman, daughter of former Alabama Gov. Don Siegelman, argued eloquently Oct. 24 during two lectures and a radio appearance against injustice, including that suffered by upon her father. The remarks came during a trip to Washington, DC as part of her nationwide campaign to obtain signatures for a presidential pardon for her father, now imprisoned. She said also that her human rights campaign is on behalf of all those involved in politics who might be targeted under vague and selective criteria, and that she strongly supports the president's re-election. Justice Integrity Project, Siegelman Seeks Justice With New Appeal, Sept. 3, 2013. Former Alabama Gov. Don Siegelman challenged his imprisonment on corruption charges last week on two grounds of legal error by his trial judge. Siegelman argued that U.S. District Judge Mark Fuller of Montgomery erred by failing to allow evidence on whether a biased prosecutor had actually recused as claimed. Siegelman argued that U.S. District Judge Mark Fuller of Montgomery erred by failing to allow evidence on whether a biased prosecutor had actually recused as claimed. Also, Siegelman's appeal to the federal appeals court in Atlanta claims that Fuller wrongly increased Siegelman's prison time by citing allegations that failed to win conviction in the 2006 jury trial. Siegelman is serving a 78-month term in one of the nation's most controversial federal prosecutions of the decade. Legal Schnauzer, President Obama chose to ignore Bush-era lawlessness, and that decision now stands to stain his legacy and wipe out progress of the past eight years, Roger Shuler, Democrats have spent the past seven days pointing fingers in all directions. Lost in all the self-flagellation is much attention for the man who probably deserves the bulk of the blame, and that would be Obama. Why? Well, the Obama presidency probably was destined to end badly before it even started. That's because in January 2009, just days before his inauguration, Obama said he was going to "look forward, not backwards" regarding issues of flaming criminality during the George W. Bush administration. In the days and weeks leading to Election Day 2016, much was written about Obama's legacy. And, in fact, he had built a substantial record of achievement. As a white male (living in Alabama at the time), I'm the rare bird in my species who voted for Obama twice. And I would not take back either vote. That makes his dismal record on justice issues even more difficult to swallow. And it brings sadness to think that by the end of Trump's first term, we probably will be back on the edge of another recession or depression. After all, Trump's economic policies are nothing but refried Reaganism and George W. Bushism, and both of those led to recessions. As a number of commentators already have stated, Obama's legacy is toast, with many of his achievements set to vanish. Obama did this to himself. PaulCraigRoberts.org, Remember Don Siegelman, Paul Craig Roberts, Jan. 18, 2017. Obama’s failures as president would fill an encyclopedia. Obama might have destroyed the Democratic Party by his failure to commute the sentence of falsely charged and falsely convicted Alabama Governor Don Siegelman. Indeed, Obama could have ordered a US Justice Department investigation that almost certainly would have resulted in prison sentences for the Republican Alabama politicians, Republican US attorneys, Republican federal judges and Republican operative Karl Rove who participated in one of the most obvious frame-ups in human history. More than 100 Democratic and Republican former attorneys general and officials condemned the prosecution of Siegelman as politically-inspired prosecutorial misconduct. Yet Obama did nothing. By doing nothing for Siegelman, Obama demonstrated to every Democrat that they were on their own if they won elections in Republican political strongholds. Justice Integrity Project, Feds Crushed Telecom CEO Who Protected Customer Data from NSA Snoops…But He’s Back, Protesting New Reform Law, Andrew Kreig, July 26, 2015. Long before 9/11 in 2001 or the reformist surveillance law signed last month, one of the nation’s top telecom executives reminded federal officials they needed court approval before his company could hand over en masse private customer data to the National Security Agency (NSA). Qwest Chairman and CEO Joseph P. Nacchio, chair of two national telecom advisory councils under the then-new Bush administration, thus followed traditional business and legal principles regarding government requests for electronic data. But Nacchio then endured a long nightmare of reprisal that is relevant to the supposed protections of the USA Freedom Act signed last month. Justice Integrity Project, Former Political Prisoners Nacchio, Bolden, Scrushy To Warn of Democracy Threats July 29 At 'Whistle Blowers Summit' In DC, Andrew Kreig, July 10, 2015. Participants in three of the most controversial and important politics-tinged criminal cases in recent American history will condemn dangers to democracy July 29 at the annual Whistle Blowers Summit on Capitol Hill in Washington, DC. Former Qwest Communications International Chairman and CEO Joseph Nacchio, former Secret Service White House special agent Abraham Bolden, and former HealthSouth CEO Richard Scrushy will speak on “Exposing U.S. Political Prosecutions & Dangers To Democracy” on a 4 p.m. panel moderated by the Justice Integrity Project. Each speaker became a participant, whistleblower, victim, and now a hero in, respectively, the national debate regarding warrantless electronic surveillance, President John F. Kennedy's 1963 assassination, and the federal prosecution of former Alabama Gov. 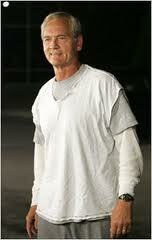 Don Siegelman, who remains imprisoned for 1999 conduct. CBS News, Defiant Joe Nacchio Lashes Out Against Those Who Sent Him To Prison, Staff report, May 28, 2014. Former Qwest CEO Joe Nacchio lashed out at those who put him in federal prison for insider trading in a rare interview. Nacchio, who was released after serving 4 1/2 years and paying millions of dollars in restitution, spoke near his home in Florida with CBS4’s Rick Sallinger. It is the only interview Nacchio has granted with a Colorado reporter to date since his time behind bars. Justice Integrity Project, Courageous Memoir Denounces Banks, Justice Dept. Corruption, Andrew Kreig, Oct. 24, 2016. Famed bank whistleblower Bradley Birkenfeld launched his tell-all memoir Lucifer’s Banker last week at the National Press Club with a harsh indictment of the nearby headquarters of the U.S. Justice Department. Birkenfeld, described earlier this year by CNBC as "the most significant financial whistleblower of all time," attacked law enforcers as being cowardly, self-seeking and deceitful in monitoring white collar crime. The schemes help the wealthy hide money, sometimes ill-gotten, and thus may hurt the criminals' spouses, business colleagues, fellow citizens, and governments. C-SPAN, Bradley Birkenfeld Discusses Lucifer's Banker, Staff interview, Nov. 13, 2016 (one hour video). 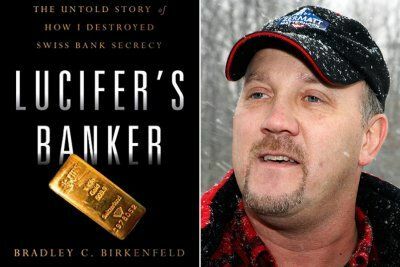 Former banker Bradley Birkenfeld talked about his book, Lucifer’s Banker: The Untold Story of How I Destroyed Swiss Bank Secrecy. Justice Integrity Project, Mr. Drake Goes To Washington, Andrew Kreig, March 21, 2013. 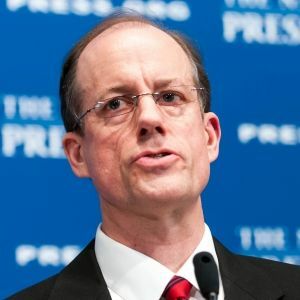 Former National Security Agency executive Thomas Drake warned the public March 15 at the National Press Club against the federal government's crackdown on whistleblowers. Drake, who narrowly escaped life in prison for communicating with a Baltimore Sun reporter, said the government has the ability to make such conduct illegal retroactively. Regarding the larger issues, he asked, “How else will the press report the real news when their sources dry up and the government becomes a primary purveyor of its own news?” Drake's revelations and passion resembled James Stewart's iconic performance in "Mr. Smith Goes To Washington" protesting corruption, including during a Senate filibuster. Yet Drake focused on dangers far more important than the 1939 film's portrayal of corruption in Congress. National Press Club, NSA whistleblower Thomas Drake criticizes government 'secrecy regime,' Sean Lyngaas, March 16, 2013. The government is going to great lengths to shut down leaks, according to Thomas Drake, a former senior executive turned whistleblower at the National Security Agency. “In our post-9/11 world, the government is increasingly in the ‘First Un-amendment’ business, engaged in a direct assault on free speech and the very foundation of our democracy,” Drake told a National Press Club luncheon audience on March 15. Drake was indicted in April, 2010, under the Espionage Act for allegedly providing classified information to the Baltimore Sun. He was eventually cleared of wrongdoing and now minces no words in warning of the perils of government secrecy. What Drake calls “the secrecy regime” - the government protocols for securing a vast cache of classified documents - has created a “misunderstanding that if you happen to speak to a reporter…by definition, anything that you might say to them could be characterized as classified.” In a passionate plea for the sanctity of the First Amendment, Drake warned that journalists are being increasingly frozen out of government sources. “How else will the press report the real news when their sources dry up and the government becomes a primary purveyor of its own news?” he asked in one of many disturbing scenarios posed to the audience. He quoted George Orwell and John F. Kennedy to the same effect: It is a slippery slope from government secrecy to tyranny. National Press Club, NPC Luncheon with Thomas Drake, March 15, 2013. Related Video: (63 minutes). Thomas Drake, a former Senior Executive at NSA who was charged under the espionage act after he blew the whistle on waste and fraud and illegal activity at the intelligence agency, spoke at a March 15, 2013 National Press Club luncheon. Drake's event was part of the club's celebration of Sunshine Week, a national initiative to underscore the importance of open government and freedom of information. Washington Post, Chelsea Manning petitions Obama for clemency on her 35-year prison sentence, Ellen Nakashima, Nov. 14, 2016. No other convicted leaker in U.S. history has received such a lengthy term. Justice Integrity Project, Former NSA Execs Warn Americans Against Loss of Political and Privacy Rights, Andrew Kreig, July 25, 2013. The NSA operates largely without accountability to other government branches or the public, according several former high-ranking NSA executives speaking July 25 at a forum at the National Press Club in Washington, DC. They said the NSA tries to collect as much phone, email, and social media data as possible from the world's population, including U.S. citizens, for storage and potential retrieval later. The process represents a massive loss of political freedom and privacy that Americans have enjoyed through history until recent years, according to panelists convened by the Government Accountability Project (GAP). GAP Executive Director Bea Edwards opened the forum by describing the pivotal role of whistleblowers to help the public understand when authorities overstep legal bounds. WhoWhatWhy, The Full Story of the Sirhan Sirhan Parole Hearing, Shane O'Sullivan, Feb. 16, 2016. Shane O’Sullivan, shown below, is the author of the book "Who Killed Bobby? The ban on video and audio recordings at Sirhan Sirhan’s parole hearing on February 9 meant the world depended on the one reporter allowed inside the hearing to tell us what happened. He had to condense “more than three hours of intense testimony” into 854 words. "Paul was a close friend and advisor to my father. He was standing beside my father when Daddy was killed and Paul was himself wounded by a bullet. With boundless energy and clear mind, Paul continues to pursue my father’s ideas, an endeavor to which he has devoted his life. He organized with the support of my mother and my family the building of the new Robert F. Kennedy Community Schools on the former Ambassador Hotel site. Paul and his team…strongly believe this new evidence is conclusive and requires a new investigation. I agree and support his request for a new investigation." The FBI refused to accept the papers Van Praag had written detailing his methodologies and discoveries. In fact, the Bureau refused to communicate with him in any way. The FBI’s examination report, obtained through a Freedom of Information Act request, shows the FBI used outdated methodologies and failed to provide their own analyst with critical background materials about the shooting scene. These included witness statements, the autopsy report and movements of key people, including Stanislaw Pruszynski himself, at the time of the shooting. Justice Integrity Project, Readers Guide To RFK Assassination: Books, Videos, Archives, Andrew Kreig, June 1, 2016. 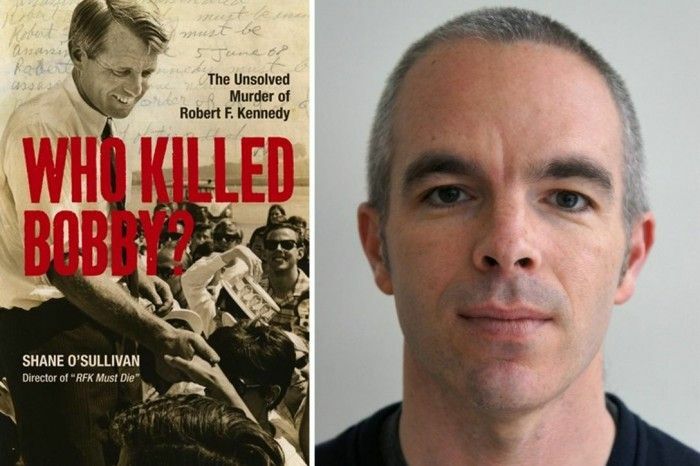 This "Readers Guide to the RFK Assassination" presents key books, videos, documents, websites and other archives most relevant to 1968 Democratic Presidential candidate Robert F. Kennedy's murder on June 6, 1968. 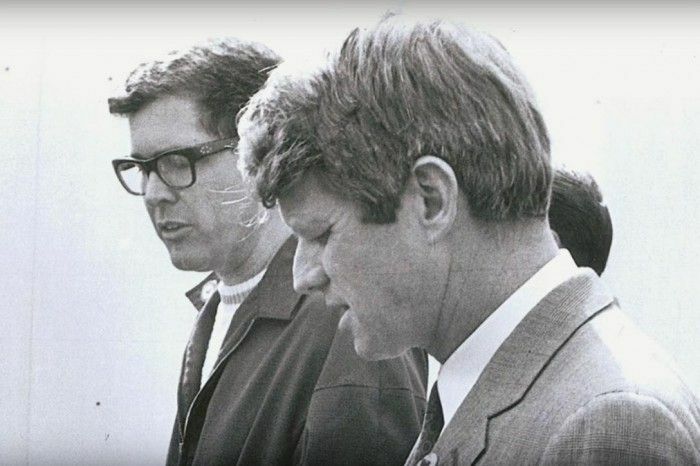 The materials focus heavily on remaining questions about responsibility and motive for Kennedy's shooting at the Ambassador Hotel in Los Angeles shortly after his victory in the California Democratic primary appeared to pave the way for his presidential nomination. Included also in this guide is research that explores the assassination's current implications for the U.S. justice system and other governance. KGTV (ABC-TV San Diego affiliate) / Channel 10 News, Did second gunman kill Robert F. Kennedy? Emily Valdez, Feb. 9, 2016. 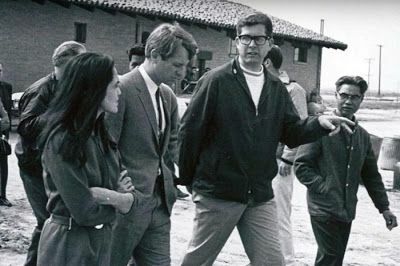 A bystander Sirhan Sirhan also shot the night Robert F. Kennedy was assassinated claims the presidential candidate was actually killed by a second gunman, who remains free to this day. It was quite the celebration at The Ambassador Hotel in Los Angeles on the night of June 5, 1968. More than 1,000 people were celebrating. Democratic Presidential Candidate Robert F. Kennedy won the California primary. His brother, President John F. Kennedy, was assassinated five years earlier by a gunman in Dallas, Texas. He was poised to be the next president. “It was just a beautiful moment,” said Paul Schrade, 91. In 1968, Schrade was a union official and friend of Robert Kennedy, or Bobby, as he called him. Schrade walked with Kennedy into the kitchen that night, after Kennedy gave his victory speech to an elated, cheering crowd. Kennedy died 26 hours later. Sirhan was convicted of murder and sentenced to life in prison. Schrade knows Sirhan fired the bullet that hit him. But he is convinced there was a second gunman who shot Kennedy. “[Sirhan] couldn’t shoot Robert Kennedy and didn’t, he was never in the position to do this,” Schrade said. Schrade said he has spent the last 40 years investigating the case. “There’s strong evidence of a second gunman,” Schrade said. He said experts re-examined evidence. “They could not match the Kennedy bullet. He got hit in the back of the neck, it was the only whole bullet, it did not match Sirhan’s gun,” Schrade said. OpEdNews, RFK Murder Cover-Up Continues After Dramatic Parole Hearing, Andrew Kreig, Feb. 26, 2016. A California parole board this month rejected a dramatic plea to release the convicted slayer of 1968 presidential contender Robert F. Kennedy, thereby continuing one of the nation's most notorious murder cover-ups. TrineDay, New book claims link between the assassination of Senator Robert F. Kennedy and the Nixon conspiracy to scuttle the Paris Peace Talks, Staff report, June 1, 2016. There is a link between the assassination of Senator Robert F. Kennedy and the Nixon conspiracy to scuttle the Paris Peace Talks. 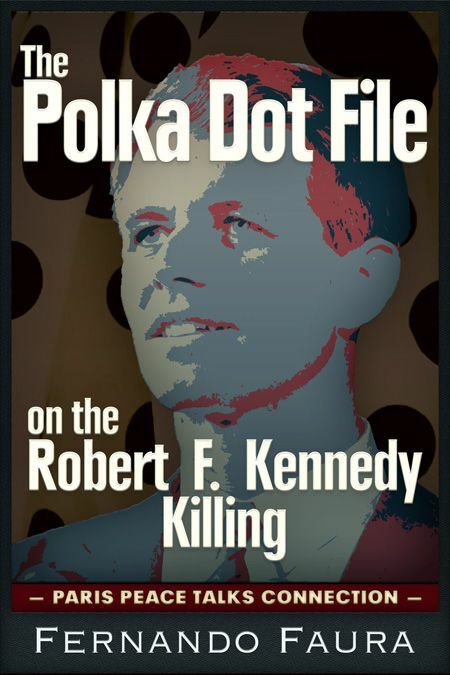 The startling, explosive allegation is made by Miami based author Fernando Faura in his new book, The Polka Dot File on the Robert F. Kennedy Killing – The Paris Peace Talks Connection, to be published by TrineDay, June 6, 2016. The Polka Dot File refers to the mystery woman in the polka-dot dress who ran out of the Ambassador Hotel in Los Angeles claiming to have shot the senator, while the alleged assassin was being pummeled and captured in the kitchen. Faura, an award winning journalist, is credited with being the only newsman to chase the mystery woman even after the police denied her existence. "I have always been fascinated by the story of John Fahey, who spent the day leading up to Bobby Kennedy's assassination with a mysterious woman whose group were “going to take care of Kennedy tonight.” Without the persistence and ingenuity of Fernando Faura, we wouldn't have that story." "As the last remaining reporter on the scene who chased the polka-dot dress mystery, here he brings us with him, day by day, on his investigation. We're transported back in time to the aftermath of Kennedy's murder in June 1968, and given suppressed witness testimony and a tantalizing new lead that connects to one of the great political scandals of the Nixon presidency. A must-read for anyone interested in this case." – Shane O’Sullivan, producer and director of RFK Must Die! ( 2007) and author of Who Killed Bobby? The Unsolved Murder of Robert F. Kennedy (2008). Justice Integrity Project, Readers Guide To JFK Assassination: Books, Videos, Archives, Andrew Kreig, April 3, 2016. To help researchers of President Kennedy's 1963 assassination and its current implications, the Justice Integrity Project began publishing a Reader's Guide in 2013 to coincide with the shooting's 50th anniversary. Justice Integrity Project, JFK, Nov. 22 and the Continuing Cover-Up, Andrew Kreig, Nov. 24, 2014. The fifty-first anniversary of President John F. Kennedy's assassination on Nov. 22 underscored how the murder and cover-up have intimidated JFK successors in both parties. 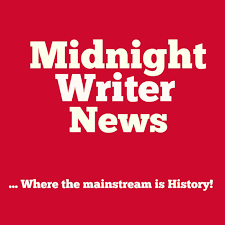 New historical books and ongoing headlines on current affairs paint a grim portrait of an unpunished assassination by a cabal so powerful that its successors decisively influenced the Johnson, Nixon and Ford presidencies and, arguably, Washington policymaking as recent as this month. Washington Post, 107 former Justice officials think this case was handled unjustly. DOJ must act, Philip B. Heymann, Dec. 26, 2016. 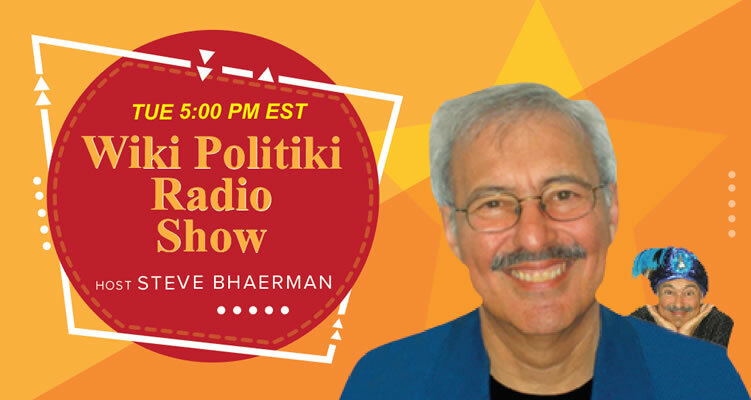 Philip B. Heymann is a former deputy attorney general under President Bill Clinton and assistant attorney general under President Jimmy Carter. 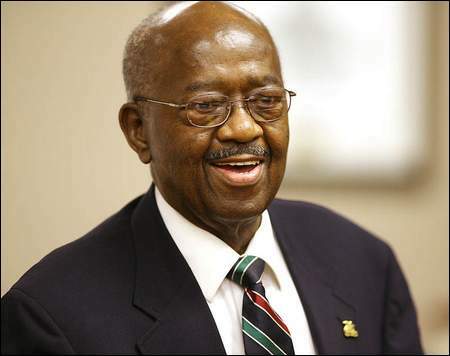 He is the James Barr Ames professor of law emeritus at Harvard University Law School. Last week, President Obama granted clemency to 153 individuals who had been incarcerated under mandatory minimum drug-sentencing laws, bringing to more than 1,100 the number of clemency petitions the administration has granted. “You don’t just try to hammer everybody for as long as you can, because you can,” Deputy Attorney General Sally Yates told the New York Times. That is the right attitude for someone tasked with the fair administration of justice. 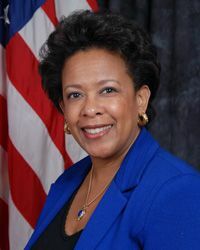 Unfortunately, Yates and Attorney General Loretta E. Lynch (shown in a file photo) have, for the past year, rebuffed efforts by me and many other former senior Justice Department officials to even discuss another prosecution in which justice fell far short: the case of Sholom Rubashkin, a Brooklyn-born rabbi who was sentenced to 27 years for bank fraud. Rubashkin, a 57-year-old father of 10 (shown in a photo), has already served seven years for the crime, which ordinarily merits no more than three years. Worse, his sentence was based on perjured testimony and prosecutorial misconduct. 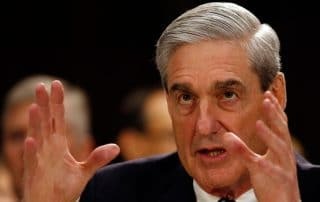 If even a few highly respected prosecutors think a particular case was handled unjustly, resulting in a vastly excessive sentence, the department’s representatives should be prepared at least to discuss the reasons. In Rubashkin’s case, 107 former Justice Department officials, including five former attorneys general, six former deputy attorneys general (myself included), two former FBI directors, 30 former federal judges and other leading jurists, have sought to meet with senior officials of the department we once served. The only response: a form letter from an assistant attorney general stating that no meeting could take place while Rubashkin was also pursuing his case in court. Meanwhile, Kevin Techau, the U.S. attorney in Iowa (where Rubashkin was prosecuted), has suggested that Rubashkin used his financial resources to buy the support of so many prominent justice officials. 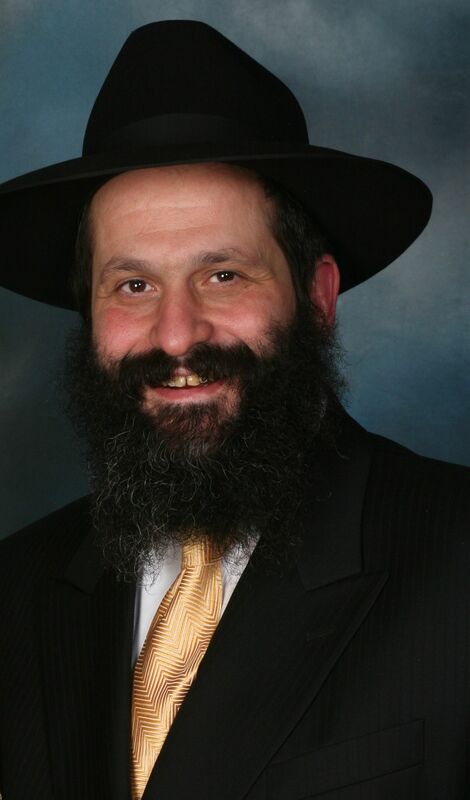 Not only has Rubashkin lost everything he owned in this case, his wife and children now depend heavily on the support of their community for their needs. Moreover, all 107 of us are working on this pro bono. Among other things, former deputy attorneys general Larry Thompson, Charles Renfrew and I have traveled to distant meetings and volunteered considerable time to this matter, all on our own nickel. Huffington Post, Obama Commutes 153 Sentences, Pardons 78, In Clemency Push, Ryan J. Reilly, Dec. 19, 2016. President Barack Obama shortened sentences of 153 federal prisoners on Monday as part of a clemency push before he leaves office in a few weeks. Obama has now commuted the sentences of 1,176 people during his presidency, and has pardoned 148. The announcement came as the president and his family were in Hawaii for a holiday vacation. Those whose sentences were commuted on Monday, granting them early release, were convicted on drug crimes. Some will be released in 2017 and 2018, while others will have to wait several years before their release date. Obama also granted pardons to 78 individuals on Monday. Separately, the United States Sentencing Commission issued a report on Monday showing a 5 percent drop in the number of federal offenders sentenced in the 2016 fiscal year from the year earlier. There are currently about 190,000 federal inmates, the fewest since 2005. Washington Post, Obama grants clemency to 79 federal drug offenders, a policy the Trump administration is unlikely to continue, Sari Horwitz​, Nov. 22, 2016. The announcement pushes the number of inmates the president has granted clemency to more than 1,000. Obama’s historic number of commutations was announced as administration officials are moving quickly to rule on all the pending clemency applications from inmates before the end of the year. The Trump administration is not expected to keep in place Obama’s initiative to provide relief to non-violent drug offenders. Deputy Attorney General Sally Yates said in a conference call with reporters Tuesday that the Justice Dept will continue to recommend more commutations through the end of the Obama administration. 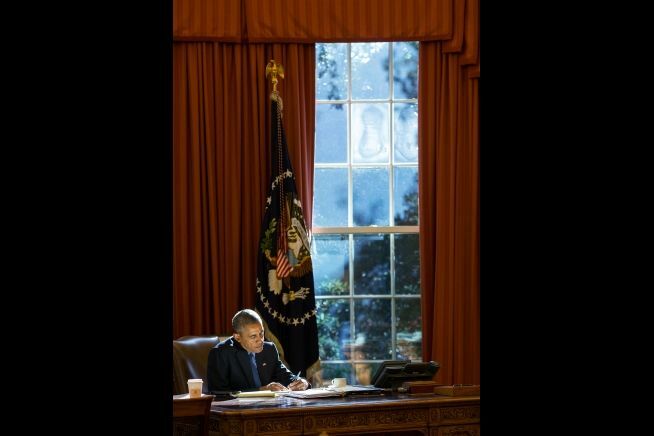 Washington Times‎, Obama executive orders, regulations, pardons expected as presidency draws to close, Stephen Dinan, Nov. 8, 2016. Look out for the executive orders, the “midnight” regulations and, perhaps most controversially, the pardons. As President Obama runs out the clock on his eight-year tenure, analysts say, he still has plenty of business left undone, and they expect him to follow the lead of other presidents and issue a series of rules, to add to his list of executive orders, to continue his record-setting pace of commutations and perhaps add a controversial pardon or two into the mix. Truly lame-duck presidents are freed from political concerns, don’t have to worry about other elections and can even help take political heat off their successor — or try to lock in their own policies that their successor might not fully support. For Mr. Obama, who already has set records for the most expansive regulatory agenda in U.S. history, his final months offer a chance to pad his lead and plow new ground, particularly on energy and environmental issues. CNN Politics, Obama reducing 102 inmates' sentences, Kevin Liptak, Oct. 7, 2016. Another 102 prison inmates learned Thursday their sentences are being reduced by a stroke of President Barack Obama's pen, the latest batch in a record-setting effort by the White House to reverse harsh sentences for mostly nonviolent drug offenders. Obama has now granted clemency to 774 individuals, the vast majority of whom were serving time for nonviolent drug crimes. Just in the past year, Obama has granted clemency to 590 prisoners -- the most commutations in any single year of US history. At the same time, the number of inmates who have applied for pardons or commutations has increased sharply in the final year of Obama's tenure, creating a backlog of requests for Obama's team to process before he leaves office in January. "I've told my office that anything that gets to us will get processed," Neil Eggleston, the White House counsel, said in an interview Thursday. "We're not going to have a failure of resources here. I'm pretty confident that we'll get to all of those." Eggleston said Obama would continue to personally review clemency requests up until the final days of his administration. "It's not uncommon for him to call me in and have various ones that he wants to talk through. He focuses individually on each one of these, knows a fair amount of information on each of them," Eggleston said. "He's essentially looking at the various pieces, and he's testing the likelihood of success on the outside. The way he really thinks about this is giving people second chances." The White House wants to bring existing sentences -- many handed down when strict "mandatory minimum" punishments were in place -- closer in line with current guidelines. Even as Congress has reduced mandatory sentences for certain drug crimes, thousands of Americans are still serving long sentences that current law no longer requires. Obama has argued the severe sentencing practices of the 1980s and 90s — a facet of the larger "war of drugs" — have destroyed communities and led to an exploded US prison population that far exceeds those in other countries. Legislative action on criminal justice reform, which seemed to gain momentum earlier this year, has been put on hold amid a contentious political election where crime has played a prominent role. Justice Integrity Project, Presidential Clemency System Broken, Experts Say, Andrew Kreig, Dec. 11, 2012. The system of presidential clemency practiced for nearly two centuries no longer functions in practice in the federal system and in most states. The system of presidential clemency practiced for nearly two centuries no longer functions in practice in the federal system and in most states. That is the dire conclusion of a bipartisan, expert panel convened Dec. 10 by the Heritage Foundation in Washington, DC. "President Obama has found only one prisoner worthy of release" in the first four years of his administration said longtime law professor Albert Alschuler. He presented statistics showing that previous presidents used their Constitution-based commutation powers far more often until recent years. Pardon Attorney. Robert A. Zauzmer (shown at right in an official photo) was named Acting Pardon Attorney on February 1, 2016 and then appointed by the Attorney General as Pardon Attorney on Monday, September 26, 2016. 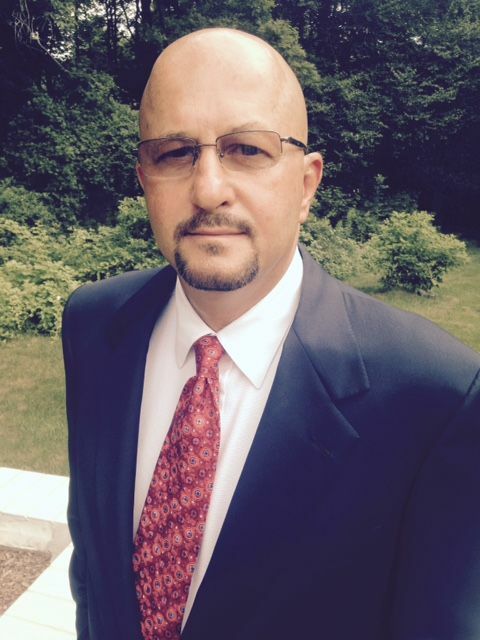 Mr. Zauzmer served as an Assistant United States Attorney and the Chief of Appeals in the U.S. Attorney’s Office for the Eastern District of Pennsylvania, as well as being a key player in the Department’s implementation of both the 2013 Smart on Crime initiative and the U.S. Sentencing Commission’s retroactive sentence reductions. The office's homepage is here. List of people pardoned or granted clemency by the President of the United States (via Wikipedia). The following list of people pardoned or granted clemency by the President of the United States documents the most prominent cases of each presidency. As granted by the Constitution (Article II, Section 2, Clause 1), Presidents have the power to grant clemency in one or more of the following ways: the ability to grant a full pardon, to commute a sentence, or to rescind a fine. U.S. Presidents have no power to grant clemency for crimes prosecuted under state law. A pardon is an executive order vacating a conviction. A commutation is the mitigation of the sentence of someone currently serving a sentence for a crime pursuant to a conviction, without vacating the conviction itself. Approximately 20,000 pardons and clemencies were issued by U.S. presidents in the 20th century alone. The records of acts of clemency were public until 1934. In 1981 the Office of the Pardon Attorney was created and records from President George H. W. Bush forward are now listed. This list includes pardons and commutations. Pardons by President George W. Bush. Pardons by President Clinton. The following is a partial list of people pardoned by Bill Clinton. As President, Bill Clinton used his power under the U.S. Constitution to grant pardons and clemency to 456 people, thus commuting the sentences of those already convicted of a crime, and obviating a trial for those not yet convicted. On January 20, 2001, he pardoned 140 people in the final hours of his presidency. Boston Globe, Former Mass. Speaker Sal DiMasi gets early release, John R. Ellement, Nov. 17, 2016. Former House Speaker Salvatore DiMasi will be released from prison early, a federal judge ruled Thursday. In a 69-page ruling, US District Court Judge Mark Wolf concluded that DiMasi, US Attorney Carmen Ortiz’s office, and federal prison officials have convincingly demonstrated that his health has declined so severely that further imprisonment was no longer warranted. DiMasi will be released on Nov. 22, the court ruled.